Yep Skal is in the news again, She's a popular girl! Hundreds of dogs ranging from Airedale terriers and Akitas to Welsh corgis took over Xinyi District last weekend for the sixth annual Taipei Pet Carnival (台北寵物跨年嘉年華). About 90 companies and organizations were represented at the event, including about 30 animal advocacy groups. The Taipei Pet Carnival, which bills itself as the largest outdoor pet event in the country, was launched in 2006 by Wawa Public Relations (Wawa 國際公關) and is held outdoors every year at the Shin Kong Mitsukoshi (新光三越) complex. While canines were the most prominent of the carnival’s four-legged attendees, some rabbits and good-natured cats turned up. The pet products and services offered ranged from organic food and gel breath fresheners to studio portraits and neon hair dye. Twenty-seven competitions included beauty contests, a dog Olympics and a rabbit show. 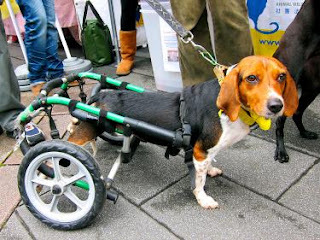 These included Skal, a beagle rescued by Animals Taiwan (台灣動物協會) after being injured in a road accident. 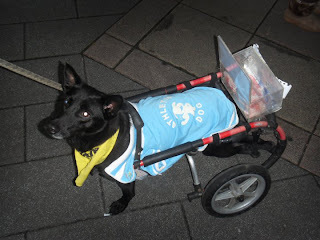 Despite being confined to a wheelchair, Skal eagerly sniffed visitors and chased after other dogs, including Gina, another Animals Taiwan rescue whose front paw was amputated after being caught in an animal trap. The group needs homes for 60 to 70 animals, but they are careful to find the right match, volunteer Michelle Lin (林青宜) said. The Taiwan Homeless Bunny Protection Association (台灣流浪兔協會), which set up a booth at the carnival for the first time this year, also seeks responsible pet owners. Hi Everyone, my name is PoPo! I love people and I love to play. I'm a healthy 4 month old male and I'm already neutered. I've been told that I'm pretty affectionate and friendly, too. You couldn't find another dog as sweet as me. Hello, my name is Addie. I hope you can still recognize me, because my fur has started to fall out again. Whenever the seasons change, my fur falls out. It’s kind of a bummer. It’s not easy for a handsome guy like me to face the world without enough fur. So, the vet recommended I start having baths again. I know I'll have my handsome mug back soon, I just need to be patient. If you have time, why not stop by the rescue center for a visit? 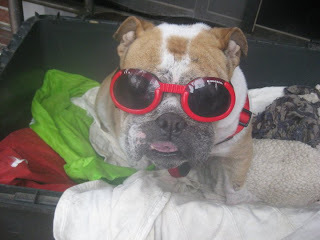 Please come and visit me...with or without fur~I love visitors! 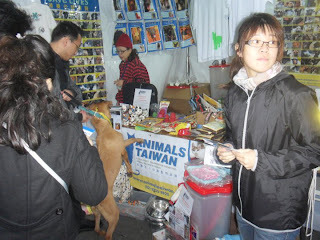 The 100 years of Taiwan 2011 Wawa pet festival was a great success for Animals Taiwan. 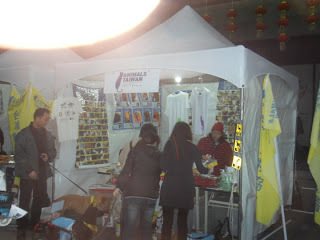 It was cold and a bit wet but our fantastic volunteers worked hard to raise money and sell our merchandise and also helped spread the word about adoptions and how to help the strays of Taiwan. Over the two day event together we raised over $35,000. 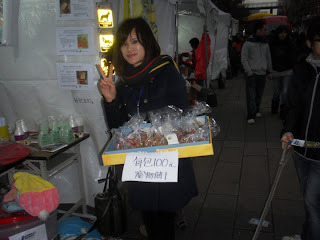 Also a big thank you to Michelle who came along to sell her delicious home made treats and helped raise more money for AT. We are so grateful to have so many fantastic volunteers willing to take time out on their weekends to help us deliver and pick up merchandise, transport doggies and help sell merchandise and promote AT. Also a big thank you to Carol who got up on stage a very short notice to talk about AT and what we do. This is a great start to 2011!! Hello! My name is Leo. I'm still a young little boy. I had a car accident and got severely injured. Nobody helped me at that moment, but I didn't give up my life and I've been trying hard to survive with a broken leg. A few days ago, a kind person found me in the street at night and took me to a vet. Despite my damaged leg, I still love to play, run around or jump up and down. I'm very affectionate and am looking forward to finding a person to bring me home. Hobbit on The Central News! A photo of Hobbit is part of a news story about the evils of gin traps. 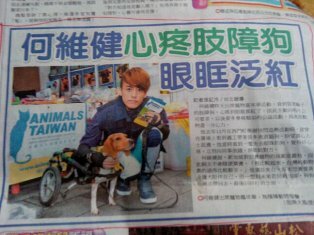 Animals Taiwan is quoted in this article as well. Although Hobbit only has 3 legs, he is the most affectionate dog at our rescue center. Any family would be lucky to have Hobbit--he is a wonderful companion. If you would like to meet Hobbit, please contact 02-2833-8820 or adoptions@animalstaiwan.org to set up a time to meet this sweet dog. Skal is in the news with a new star! 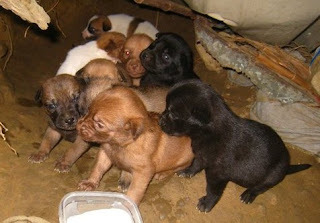 After we found 11 puppies in the moutain, ( we are now trying to find homes for them. Please contact us if you can adopt or help.) 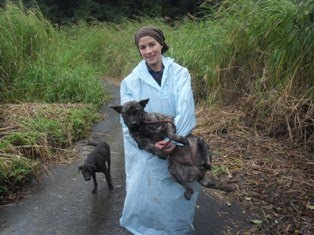 Today, on a cold and wet morning, I set out to catch 3 female dogs. However, I only got one. ( I got lost in the mountains and got far too much exercise). 1 female puppy still needs to be with her mom. She's very friendly and we will get her after Chinese New Year. 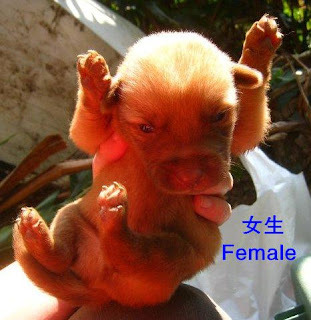 1 female looks like she's feeding puppies but haven't found the puppies, we will also get her after Chinese New Year. She's also very friendly. These are the ones I saw today but Andrea told me there should be more. I want to get them too after Chinese New Year. I've already booked with Dr Lin (10 dogs) but I'll need another car as mine won't have enough space. 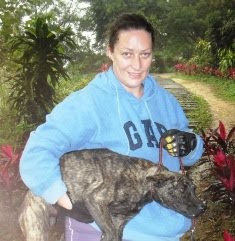 They all came out today but I can only touch the male brindle. Hello, my name is Long John. I was laid up in the hospital for a few days. The cold weather made me so weak that I couldn't even walk. But things are looking up, because now I'm cruising around in a padded vest. I don't handle the cold very well, so Xiao Huei was kind enough to give me some new threads. The vest is pink, but I don't mind. It's nice and warm! I'm glad I was rescued and brought to the AT rescue center. I don't know how many other animals are out there sick like me, out in weather so cold they can't help but shiver. Please continue to support Animals Taiwan. 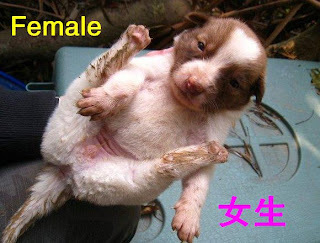 With your support, Animals Taiwan can devote all its time and energy to improving the lives of animals like me. Please contact us at 02-2833-8820 or adoptions@animalstaiwan.org for more information on how you can help. 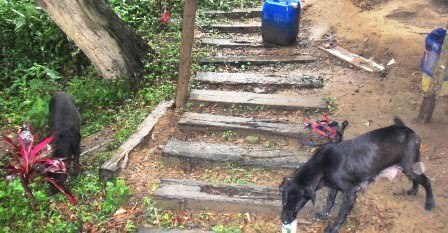 We found these 11 puppies in the hills around Xindian. We hope to find homes for these little guys soon. In this area, two dogs have already lost a leg each to gin traps. These 11 pups are barely one month old—they are pudgy little fur balls full of vim and vigor. Please contact us at 02-2833-8820 or adoptions@animalstaiwan.org if you would like to adopt one of these cuties. If you can't adopt one, please try to put out the word that they are looking for good homes. Thank you. The pups are still in Xindian, please feel free to come visit them. There is 1 black and white (male), 4 brown (3 male & 1 female), 2 black (1 male & 1 female), 2 brown and white (1 male & 1 female), and 2 red (1 male & 1 female). The puppies' mother is about 12 kg, so the pups will probably grow to be about the same. We will be responsible for spaying and neutering the puppies, so there is no need to worry about them going into heat.